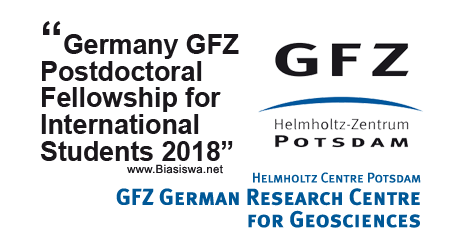 Germany GFZ Postdoctoral Fellowship for International Students 2018 - New scholarship programme started has now started accepting applications for GFZ PostDoc Fellowship that aim at adding to the future direction of GFZ's research. The positions are planned to be filled as of November 2018. Study Subject: GFZ has established a fund to promote the topics in GFZ's research program, the topic innovation fund (TIF). TIF is intended as an incentive for the further development of the program topics.